Hello there! I wanted to let you in on what I’m craving, and that’s a mango vanilla parfait! This is great because it is non-dairy, raw, and there’s no processed sugar. I love it as a summer time refreshing treat! 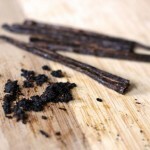 To start off, we’ll make the vanilla crème. What you’ll need is some raw cashews soaked in water. I like them when they’re soaked, because they’re creamier and easier to blend. Then you get some fresh dates, about a half teaspoon of vanilla extract, a little water, a dash of salt and we’re on our way. I’m going to use my high-powered blender, but any juicer will do. Just add a cup of cashews and dates (2) and some water and then blend for 1-2 minutes. Once you blend it, taste it to see if it needs more sweetener. Then just add water to make a puree, about 1/3 cup, add extract and everything else. After I blended it once, I found that it did need more sweetener so I added 2 more dates (de-seeded – don’t forget that! ), then I ground a little bit of Himalayan salt to enhance the flavor. Blend once more until smooth…Much better! The first step I’ll show you is how to cut the mango. Put it on its side; slice it next to the pit, on either side, then cut a tic-tac-toe pattern to the skin but not through it. Then “bend” the mango so the squares pop out into the blender. Easy, right? 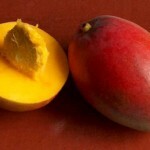 To get more meat out of the mango, lay it on its side and cut at an angle and cut as much of the meat away from the seed. In general, two mangos makes two cups. The other ingredients for the mango puree are lime and coconut oil. The coconut oil will become very liquidy in the hot summer months (firm when you purchase it), but that’s ok, it hasn’t gone rotten. Use a citrus press for the lime and squeeze 1-1.5 tbsp right into blender. Then put 1+ tbsp of coconut oil in and blend to puree. A martini glass is the perfect serving glass for the parfait; create layers to make your parfait even more inviting and appetizing. Add a layer of mango first, you can add a sprinkling of other berries if you want, then vanilla crème, then another layer of mango, then another layer of vanilla crème on top. Voila! Because of the natural sugars that digest and metabolize better than process sugar and the amount of healthy fats, this is a great and guilt-free desert! That’s it for now, but don’t forget to check out my fat loss reports right here at kardenaskitchen.com! OMG that sounds sooooo yummy! I think I will make this Wednesday night for my trainer on Thursday morning. I think she will be most surprised. I just had to try this one right away and boy was it delicious! My family went nuts over it too, including my teenage son (a Häagen-Dazs addict!). Just wanted to ask how you managed to keep the cream so white. Mine turned out light brown, like mocca, due to the dates. The presentation was not as bright & refreshing looking but the taste was nevertheless out of this world. Keep these kind of recipes coming… much appreciated! Awesome! To win over a teenage boy is a huge accomplishment. great job! Now about the cream sauce, make sure the cashews are raw. Maybe somebody else has had this happen and could make a recommendation. I will keep them coming! 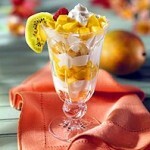 I don’t want to toot my own hort but.. Oh My Gosh that Mango Parfait turned out great! I just made it and gave a little glass to my roommates and of course made one nice size jug for my trainer. That was so sweet and delicious it’s hard to believe it’s not bad for you. Ya know if you keep making recipes like this… we all might turn Vegan. Thanks again Kardena! You Rock! I had some raw macadamia nuts on hand so I thought that might be a good substitute for the cashews. I also had chopped (dried) dates and frozen mango, plus coconut milk in place of coconut oil. I thought it was pretty good, although fresh mango would have been better; the frozen mango isn’t always very sweet. I had to add some extra sweetener to it. Thanks for the great recipe! Yes nothing substitutes fresh mangoes! Sometimes with frozen fruit they package before it’s ripe. I also tried macadamia nuts but the sauce doesn’t taste the same. Cashews are definitely better. 2nd try will be better! This recipe is incredible! I shared it with my sister and her friend and both were surprised to find out it didn’t come from the store or Jamba Juice. They loved it!! They both asked for the recipe and I said No, Instead I gave them your website so they can check it out for themselves. That’s right… made them work for it! Thank you Kardena! That’s the best idea! You rock! Blow them away and give them the gold. Are the recipes in the book interchangeable, such as can you eat any breakfast or any lunch in the 90 day meal plan. Yes the breakfasts are interchangeable, they are about the same ratios.